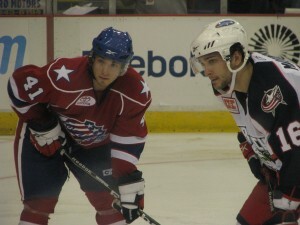 Amerks Lose Second Straight On The Road. 8-3 · Let's Go Amerks! The Bears and Amerks were supposed to renew their rivalry tonight in Hershey. And if they did, the Bears came out on top big time. I really don’t even have words to show my dissapointment in tonight’s game. I would like it if Curt Styres or someone from the Amerks would give me back my $6 I paid to watch this game on my computer. The first period and a half weren’t too bad. The Bears would score then the Amerks would tie it up. Then the flood gates broke open and the Bears scored three axtra goals by the end of the second making the score 5-2. The third period was just sad, the Bears scoring three more goals while the Amerks managed to squeeze one more in. Mike Duco (Micflicier, Ellerby) 19:23 in the first period. Kenndal McArdle (Garrison, Micflikier) 10:41 in the third period. That is all I am writing about this game. I don’t want to say anything I am going to regret later.